Nella an adventurous young girl who is a princess and a knight. She is one of a kind, brave and a modern princess who loves jousting and jewellery. Here are some of the coolest Nella the Princess Knight toys you might like. Assuring you high quality, odourless, and do not break easily. Get them all now. Shop online now and enjoy our effortless shopping experience! 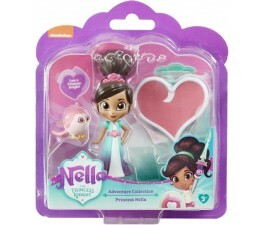 Nella The Princess Knight Style Me Bring out your child's inner stylist with Style Me Nella figures and accessories. An assortment of articulated Princess & Knight 6"" scale dolls with hair play. Time to be a Princess Knight! The Style Me Nella dolls have moveable arms and legs and come with a secret comb to style Nella’s hair. Be Nella! Sparkle Sword Sword with lights and sounds. It’s time to be a Princess Knight! If your kids want to have some action then Be Nella Sparkle Sword is the toy. Nella’s sword is one of her favourite tools, which she uses to guide the way on lots of her Knightly quests. This Sparkle Sword lights up and includes phrases from the show, and when the included wearable hair slide tiara is plugged into the hilt, more phrases are magically unlocked! 3 x AAA batteries included. Suitable for ages 3 years and over. Are your kids an ultimate fan of Nella? Our wide assortment of Nella's toys will surely put a sparkle in your child's eyes. A perfect gift to a Nella's fan. Kids will have heaps of fun and adventures playing with their toys. Get them now at Mr Toys Toyworld.